Vegetable smoothies do not have to be green! Here are two of my favourites that will help to give your system a kick start! The delicious carrot smoothie is packed with vitamin C and the beetroot smoothie is brimming with antioxidant goodness. If you are always in a rush in the mornings and do not have time for a proper breakfast, these smoothie recipes can be made in seconds and even drunk on the way to work if required. Both recipes make two good servings and are ideal as breakfast smoothies. This delicious combination of vegetable and fruit contains plenty of vitamin C to give your immune system a boost and also contains antioxidant betacarotene. 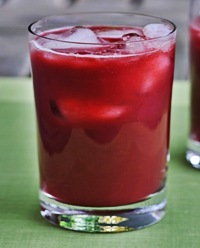 Couple these with the energizing fruit sugars and your day gets off to a great start. Scrub or thinly peel six medium sized carrots and chop into chunks, quarter and core two medium sized eating apples, (Coxes Orange Pippin are particularly delicious) and peel and segment two small juicy oranges. Place all the ingredients in your smoothie maker and whizz until combined and smooth. This mixture may well be too thick and you will find that adding a small amount of sparkling mineral water helps to make this a truly refreshing start to the morning. This delicious smoothie is cleansing and nourishing for your system and is rich in protective antioxidants. To make two delicious glasses, prepare six medium sized carrots as in the recipe above, chop four celery sticks and wash two ounces of baby spinach leaves. Combine all the ingredients in your smoothie maker and whizz until smooth. I like to add a pinch of sea salt and a generous helping of freshly ground black pepper into the mixture but if you are on a low sodium diet, you may want to leave out the salt. Add sparkling mineral water as above until your smoothie is at the desired consistency. Both smoothies are best drunk immediately or soon after making so if you are rushing off to work, decant your smoothie mixture into a sports drink bottle and take it with you. Tip: On hot days, add some ice cubes to the mixture in the smoothie maker for a deliciously creamy-textured smoothie. (In this case reduce or leave out the mineral water). If you are using an ordinary blender that cannot cope with crushing ice cubes, you could always add crushed ice instead.